I gotta find out what shampoo Georgie was using. Watched part I of the new Martin Scorsese documentary about George Harrison tonight on HBO and let me tell you, it was friggin' fantastic. Especially hearing stories about the Beatles' early days in Liverpool. The film features interviews with the guys (both old and recent) as well as stories from Eric Clapton, friends and collaborators, talking about how the band grew up together both literally and figuratively. - Paul telling the story of when he first introduced George to John -- on the top of a double decker bus in Liverpool -- and how 15-year-old George essentially auditioned for the Beatles and blew John away with his guitar skills. 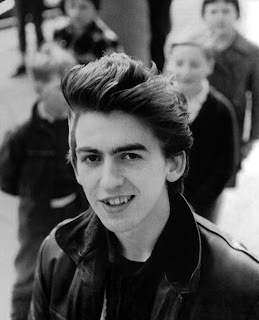 - George's letters written to his folks back home during the Beatles trek to America. Describing how they had to exit concerts in ambulances to avoid their rabid fans. And later telling his parents about a visit to Burt Lancaster's house and swimming in his pool that was "as warm as a bath." I've always maintained that Ringo is my favorite (and I still think he is), but there's something very honest and sweet about George that makes him so lovable -- and a great subject for a film. I mean, I also think Mariah Carey would be a great subject for a film, but for completely different reasons. Part II airs Thursday night at 9er on HBO. No word on whether or not Scorsese (on anyone else) will be making that Mariah film. My husband forgot to record this and he's been crying about it all day. This is the type of comment I'm looking for on TV Mu Whale Warptches!